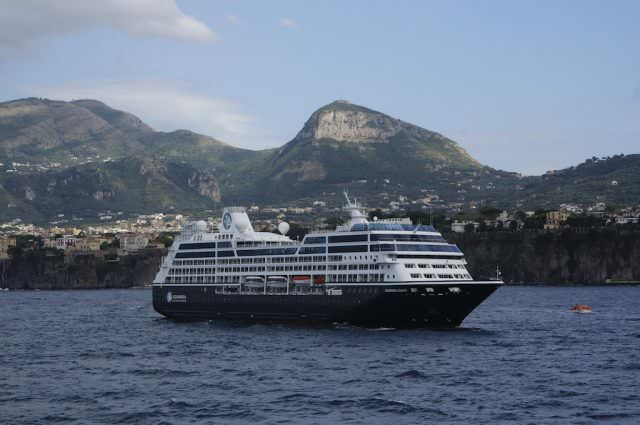 Azamara Club Cruises was founded in 2007 as a sister-line to Celebrity Cruises and Royal Caribbean. The “Club” moniker is meant to suggest “country club,” and that really is the kind of feeling you get on board. Azamara offers a more high-end product than the mainstream megaship lines, but it stops short of being a true luxury line — and for cruisers, that’s a good thing, since with Azamara you get a lot of near-luxury amenities without paying the full luxury price. Azamara’s ships, Azamara Journey and Azamara Quest, are beautifully designed midsize vessels carrying only 694 passengers and about 390 crew — a passenger/staff ratio that’s higher than you’ll find at any of the mainstream and premium cruise lines, and not far off what you find on the luxury ships. A third ship, Azamara Pursuit, was added to the fleet in 2018. Built as R Eight for now-defunct Renaissance Cruises, she is a direct sister to Azamara Journey and Azamara Quest. 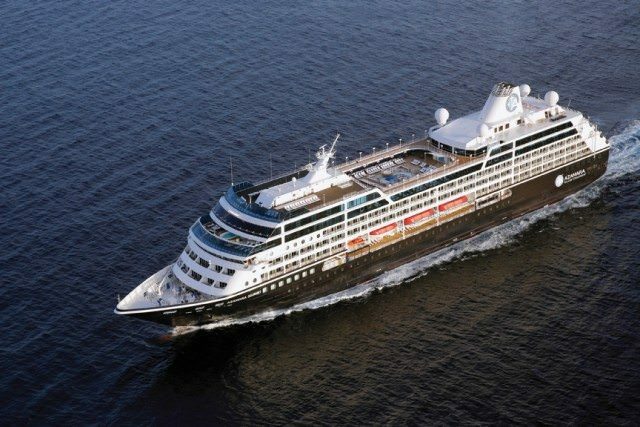 Acquired from P&O as Adonia, Azamara is putting her through a comprehensive, stem-to-stern drydock lasting over three months at the Harland & Wolff shipyard in Belfast, Ireland before she officially enters service as Azamara’s third vessel on August 1, 2018, with an inaugural cruise from Southampton, England to Norway. Service is definitely one of Azamara’s high points. Suites all come with real butler service, and attendants in regular staterooms will even unpack your luggage for you, by request. 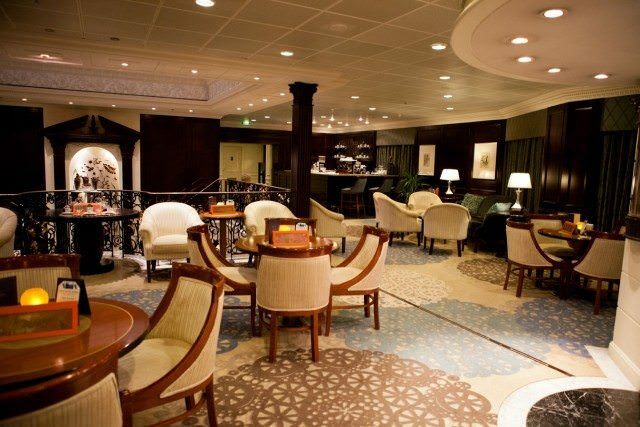 At the start of the European season in 2013, Azamara began to include complimentary standard spirits, wines and international beers throughout the ship’s bar during regular opening hours. And like the luxury lines, Azamara includes staff gratuities in its cruise prices, so you don’t ever have to think about tipping. Suite Guests receive amenities in addition to the ones shown above. These include full English butler service; 235 minutes of complimentary internet or $150 per person towards a full unlimited package for the entire voyage; one free bag of laundry per suite per seven days; complimentary specialty restaurant dining; and afternoon tea service served in-suite. Complimentary specialty coffees, soda, and bottled water available anytime. One of the line’s best — and most distinguishing — features only came about this past year when the company created new, complimentary adventures ashore, dubbed AzAmazing Evenings, offered on every voyage. These special events take advantage of the line’s numerous late-night and overnight port stays. AzAmazing Evenings kicked off in the spring of 2013 with a special event in Seville, Spain. During the complimentary excursion, guests visited the Andalusian capital of Semana Santa before continuing on to the Rock of Gibraltar to watch the Royal Gibraltar Regiment Band play at the renowned St. Michael’s Cave. Guests could choose between two concert times (5:30 p.m. and 7:30 p.m.). Azamara even provided local canapés and cocktails, free of charge. Since then, AzAmazing Evenings have become one of the line’s most popular hallmarks. Expect a polished, quiet and soothing onboard experience. Like its luxury aspirations suggest, Azamara includes plenty of subtle touches and graces that make the experience special, like the fresh flower displays around the public areas; the complimentary fresh juice bar in the casual restaurant; and the cold towels offered to you at the gangway after a hot day in port. Across its fleet, the line offers a solid mix of activities, from traditional games like shuffleboard and bridge tournaments to more unusual programs like golf clinics, poetry get-togethers, art seminars, computer classes, and wine-tasting sessions. At night, you can take in a floor show or comedy performance at the theater, hit the casino, watch a late-night movie, go dancing, or catch an after-hours piano set at the cafe. Mingling with your fellow guests is all part of the fun, and Azamara encourages passengers to find their own little corners of joy on each and every voyage. Unlike a big ship cruise, there isn’t a lot of pressure here to take part in organized activities, production shows, or other forms of manufactured fun. The Azamara experience is more organic and personal. 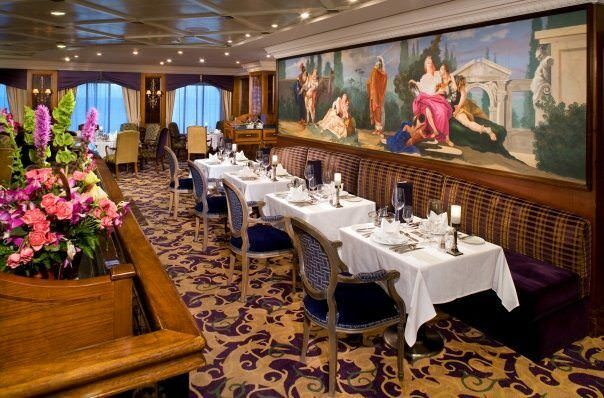 Elegant dining in Prime C aboard Azamara Journey. Photo courtesy of Azamara Club Cruises. Dining is always casual and relaxed, with the main Discoveries Restaurant providing a sumptuous, multi-course dining experience, while The Patio and Windows Cafe serve up casual meals by day and night. Aqualina focuses on Italian-inspired cuisine, with dishes like lobster ravioli, followed by arugula and radicchio with prosciutto chips, and a Venetian seafood platter. This venue carries a $30 per person surcharge, though it is complimentary for suite guests. 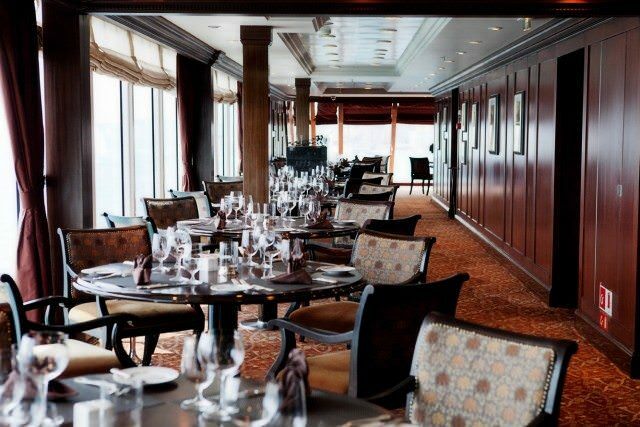 Prime C is Azamara’s classic American steakhouse experience. Crab cakes, prime cuts, lamb, game hen and seafood are just a few of the items on the menu at this wood-paneled wonder. Reservations are recommended, and a $30 per person surcharge applies to all non-suite guests. Perhaps the ultimate dining experience on any Azamara ship is the Chef’s Table. An exclusive five-course meal paired with select wines designed to accentuate each dish, the Chef’s Table is available for $95 per person and is hosted by one of the ship’s Senior Officers or a guest speaker. Dining packages are also available for guests who want to try out all of Azamara’s specialty venues on a single sailing. Sample packages include three nights for $70 per person, or four nights for $95. Also featured throughout the fleet is the sumptuous Sanctum Spa, which offers a host of spa treatments and massages, as well as gyms equipped with the latest in exercise equipment. Exercise classes include yoga, Pilates and a number of cardiovascular based work-outs. Chinese acupuncture is offered, as well as the services of massage therapists. An 18% gratuity is automatically added to all spa treatments. Who Is Azamara Best For? While Azamara does offer some weeklong cruises, most of its trips are 11 nights or longer, sailing mostly in Europe, Asia, South America, and the Caribbean. These relatively long itineraries, the generally quiet atmosphere onboard, and the higher-than-mainstream prices tend to attract an adult crowd, from their mid-40s on up. These ships are not for families with children, since Azamara doesn’t offer any kind of kids’ activities at all. And they’re not for smokers either, since Azamara has one of the strictest no-smoking policies at sea — which, of course, is a plus for non-smokers. Want Help With Your Azamara Cruise? Avid Cruiser Posts, Photographs and Videos Featuring Azamara Cruises. On Azamara Quest: Table for 18? What’s Cooking On Azamara Quest? How Will Larry Pimentel Change Azamara?